"Billings" redirects here. For other uses, see Billings (disambiguation). Billings is the largest city in the U.S. state of Montana, with a population estimated at 109,642 as of 2017. Located in the south-central portion of the state, it is the seat of Yellowstone County and the principal city of the Billings Metropolitan Area, which has a total a population of 170,498. It has a trade area of over 500,000. "Magic City" "City by the Rims" "Star of the Big Sky Country" "Montana's Trailhead"
Billings was nicknamed the "Magic City" because of its rapid growth from its founding as a railroad town in March 1882. The city is named for Frederick H. Billings, a former president of the Northern Pacific Railroad. With one of the largest trade areas in the United States, Billings is the trade and distribution center for much of Montana east of the Continental Divide, Northern Wyoming, and western portions of North Dakota and South Dakota. Billings is also the largest retail destination for much of the same area. The city is experiencing rapid growth and a strong economy; it has had and is continuing to have the largest growth of any city in Montana. Parts of the metro area are seeing hyper growth. From 2000 to 2010 Lockwood, an eastern suburb of the city, saw growth of 57.8%, the largest growth rate of any community in Montana. Billings has avoided the economic downturn that affected most of the nation 2008–2012 as well as avoiding the housing bust. With more hotel accommodations than any area within a five-state region, the city hosts a variety of conventions, concerts, sporting events, and other rallies. With the Bakken oil development in eastern Montana and western North Dakota, the largest oil discovery in U.S. history, as well as the Heath shale oil discovery just north of Billings, the city's growth rate stayed high during the shale oil boom. Although the city is still growing, the rate of increase has diminished markedly with oil price declines in recent years. Area attractions include Pompey's Pillar, Pictograph Cave, Chief Plenty Coups State Park, Zoo Montana, and Yellowstone Art Museum. Within 100 miles are Little Bighorn Battlefield National Monument, Bighorn Canyon National Recreation Area, Red Lodge Mountain Resort, and the Beartooth Highway, which links Red Lodge to Yellowstone National Park. The downtown core and much of the rest of Billings is in the Yellowstone Valley which is a canyon carved out by the Yellowstone River. Around 80 million years ago, the Billings area was on the shore of the Western Interior Seaway. The sea deposited sediment and sand around the shoreline. As the sea retreated it left behind a deep layer of sand. Over millions of years this sand was compressed into stone that is known as Eagle Sandstone. Over the last million years the river has carved its way down through this stone to form the canyon walls that are known as the Billings Rimrocks or the Rims. About five miles south of downtown are the Pictograph Caves. These caves contain over 100 pictographs (rock paintings), the oldest of which is over 2,000 years old. Approximately 30,000 artifacts (including stone tools and weapons) have been excavated from the site. These excavations have indicated that the area has been occupied since at least 2600 BCE until after 1800 CE. The Crow Indians have called the Billings area home since about 1700. The present-day Crow Nation is just south of Billings. In July 1806, William Clark (of the Lewis and Clark Expedition) passed through the Billings area. On July 25 he arrived at what is now known as Pompeys Pillar and wrote in his journal "... at 4 P M arrived at a remarkable rock ... this rock I ascended and from its top had a most extensive view in every direction." 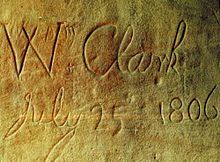 Clark carved his name and the date into the rock, leaving the only remaining physical evidence of the expedition that is visible along their route. He named the place Pompy's Tower, naming it after the son of his Shoshone interpreter and guide Sacajawea. In 1965, Pompeys Pillar was designated as a national historic landmark, and was proclaimed a national monument in January 2001. An interpretive center has been built next to the monument. The area where Billings is today was once known as Clark's Fork Bottom. Clark's Fork Bottom was to be the hub for hauling freight to Judith and Musselshell Basins. At the time these were some of the most productive areas of the Montana Territory. The plan was to run freight up Alkali Creek, now part of Billings Heights, to the basins and Fort Benton on the Hi-Line. In 1877 settlers from the Gallatin Valley area of the Montana Territory formed Coulson the first town of the Yellowstone Valley. The town was started when John Alderson built a sawmill and convinced PW McAdow to open a general store and trading post on land that Alderson owned on the bank of the Yellowstone River. The store went by the name of Headquarters and soon other buildings and tents were being built as the town began to grow. At this time before the coming of the railroad, most goods coming to and going from the Montana Territory were carried on paddle riverboats. It is believed that it was decided to name the new town Coulson in an attempt to attract the Coulson Packet Company that ran riverboats between St Louis and many points in the Montana Territory. In spite of their efforts the river was traversed only once by paddle riverboat to the point of the new town. Coulson was a rough town of dance halls and saloons and not a single church. The town needed a sheriff and the famous mountain man John "Liver-Eating" Johnson took the job. Many disagreements were settled with a gun in the coarse Wild West town. Soon a graveyard was needed and Boothill Cemetery was created. It was called Boothill because most of the people in it were said to have died with their boots on. Boothill Cemetery today sits within the city limits of Billings and is the only remaining physical evidence of Coulson's existence. When the railroad came to the area Coulson residents were sure the town would become the railroads hub and Coulson would soon be the Territories largest city. The railroad only had claim to odd sections and it had two sections side-by-side about two miles west of Coulson. Being able to make far more money by creating a new town on these two sections the railroad decided to create the new town of Billings, For a short time the two towns existed side-by-side with a trolley even running between the two. However, most of the residents of Coulson ended up moving to the new booming town of Billings. In the end Coulson faded away with the last remains of the town disappearing in the 1930s. Today Coulson Park, a Billings city park, sits on the river bank where Coulson once was. Named after Northern Pacific Railway president Frederick H. Billings, the city was founded in 1882. The Railroad formed the city as a western railhead for its further westward expansion. At first the new town had only three buildings but within just a few months it had grown to over 2,000. This spurred Billings' nickname of the Magic City because, like magic, it seemed to appear overnight. Panoramic view of downtown Billings 1915. View is to the east and south from a high point at the intersection of North 28th Street (street extending away in the right half of the photo) and 3rd Avenue North (street extending away in the left half of the photo). The nearby town of Coulson appeared a far more likely site. Coulson was a rough-and-tumble town where arguments were often followed by gunplay. Liver-Eating Johnston was a lawman in Coulson. Perhaps the most famous person to be buried in Coulsons Boothill cemetery is Muggins Taylor, the scout who carried the news of Custer's Last Stand to the world. Most buried here were said to have died with their boots on. The town of Coulson had been situated on the Yellowstone River, which made it ideal for the commerce that steamboats brought up the river. However, when the Montana & Minnesota Land Company oversaw the development of potential railroad land, they ignored Coulson, and platted the new town of Billings just a couple of miles to the northwest. Coulson quickly faded away; most of her residents were absorbed into Billings. Yet, for a short time, the two towns coexisted; a trolley even ran between the two. But ultimately there was no future for Coulson as Billings grew. Though it stood on the banks of the Yellowstone River only a couple of miles from the heart of present-day downtown Billings, the city of Billings never built on the land where Coulson once stood. Today Coulson Park sits along the banks of the Yellowstone where the valley's first town once stood. By the 1910 census, Billings's population had risen to 10,031 ranking it the sixth fastest-growing community in the nation. Billings became an energy center in the early years of the twentieth century with the discovery of oil fields in Montana and Wyoming. Then the discovery of large natural gas and coal reserves secured the city's rank as first in energy. Built in 1985 and standing at 272 feet, First Interstate Center is the tallest building in Montana. After World War II, Billings boomed into the major financial, medical and cultural center of the region. Billings has had rapid growth from its founding; in its first 50 years growth was, at times, in the 300th and 400th percentile. Billings's growth has remained robust throughout the years, and in the 1950s, it had a growth rate of 66 percent. The 1973 oil embargo by OPEC spurred an oil boom in eastern Montana, northern Wyoming and western North Dakota. With this increase in oil production, Billings became the headquarters for energy sector companies. In 1975 and 1976, the Colstrip coal-fire generation plants 1 and 2 were completed; plants 3 and 4 started operating in 1984 and 1986. In the 1970s and 1980s, Billings saw major growth in its downtown core; the first high-rise buildings to be built in Montana were erected. In 1980, the 22-floor Sheraton Hotel was completed. Upon its completion, it was declared "the tallest load-bearing brick masonry building in the world" by the Brick Institute of America. During the 1970s and 1980s, other major buildings were constructed in the downtown core; the Norwest Building (now Wells Fargo), Granite Tower, Sage Tower, the MetraPark arena, the TransWestern Center, many new city-owned parking garages, and the First Interstate Center, the tallest building in a five-state area. With the completion of large sections of the interstate system in Montana in the 1970s, Billings became a shopping destination for an ever-larger area. The 1970s and 1980s saw new shopping districts and shopping centers developed in the Billings area. In addition to the other shopping centers developed, two new malls were developed, and Rimrock Mall was redeveloped and enlarged, on what was then the city's west end. Cross Roads Mall was built in Billings Heights, and West Park Plaza mall in midtown. In addition, several new business parks were developed on the city's west end during this period. Billings was affected by the 1980 eruption of Mount St. Helens in May; the city received about an inch of ash on the ground. The Yellowstone fires of 1988 blanketed Billings in smoke for weeks. In the 1990s, the service sector in the city increased with the development of new shopping centers built around big box stores such as Target, Walmart and Office Depot, all of which built multiple outlets in the Billings area. With the addition of more interchange exits along I-90, additional hotel chains and service industry outlets are being built in Billings. Development of business parks and large residential developments on the city's west end, South Hills area, Lockwood, and the Billings Heights were all part of the 1990s. Billings received the All-America City Award in 1992. In the 21st century, Billings saw the development of operations centers in the city's business parks and downtown core by such national companies as GE, Wells Fargo and First Interstate Bank. It also saw renewed growth in the downtown core with the addition of numerous new buildings, new parking garages and a new MET Transit Center, and in 2002 Skypoint was completed. Downtown also saw a renaissance of the historic areas within the downtown core as building after building was restored to its previous glory. In 2007, Billings was designated a Preserve America Community. With the completion of the Shiloh interchange exit off Interstate 90, the TransTech Center was developed and more hotel development occurred as well. In 2010 the Shiloh corridor was open for business with the completion of the Shiloh parkway, a 4.8-mile (7.7 km) multi-lane street with eight roundabouts. More shopping centers were developed in the 21st century. One of the new centers is Shiloh Crossing, which brought the first Kohl's department store to Montana. Other new centers include Billings Town Square with Montana's first Cabela's, and West Park Promenade, Montana's first open-air shopping mall. In 2009, Fortune Small Business magazine named Billings the best small city in which to start a business. Billings saw continued growth with the largest actual growth of any city in Montana. On June 20, 2010 (Father's Day), a tornado touched down in the downtown core and Heights sections of Billings. The Rimrock Auto Arena at MetraPark and area businesses suffered major damage. While the nation has been feeling the effects of a recession, Billings's economy has been strong. Construction and housing starts have been up as well as large investments in the community by national companies and major new road construction projects. The state's economy is healthier than most states but as western Montana is suffering from a crash in real estate and the near demise of its timber industry, eastern Montana and North Dakota are experiencing an energy boom due to coal and the Bakken formation the largest oil discovery in U.S. history. Billings is Montana's oasis of economic growth. In August 2016, a 324 foot high rise complex called the One Big Sky Center was proposed for downtown Billings. If built, it would be the tallest building in Montana and Montana's first 300-foot plus building. The Rims border the northern and eastern edges of the downtown core. Billings is located at 45°47′12″N 108°32′14″W﻿ / ﻿45.78667°N 108.53722°W﻿ / 45.78667; -108.53722 (45.786553, −108.537139), with two-thirds of the city being in the Yellowstone Valley and the South Hills area and one-third being in the Heights-Lockwood area. The city is divided by the Rims, long cliffs, also called the Rimrocks. The Rims run to the north and east of the downtown core, separating it from the Heights to the north and Lockwood to the east, with the cliffs to the north being 500 feet (150 m) tall and to the east of downtown, the face rises 800 feet (240 m). Billings elevation is 3,126 feet above sea level. The Yellowstone River runs through the southeast portion of the city. According to the United States Census Bureau, the city has a total area of 43.52 square miles (112.72 km2), of which, 43.41 square miles (112.43 km2) is land and 0.11 square miles (0.28 km2) is water. Around Billings, seven mountain ranges can be viewed. The Bighorn Mountains have over 200 lakes and two peaks that rise to over 13,000 feet (4,000 m): Cloud Peak (13,167 ft (4,013 m) and Black Tooth Mountain (13,005 ft (3,964 m). The Pryor Mountains directly south of Billings rise to a height of 8,822 feet and are unlike any other landscape in Montana. 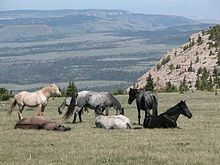 They are also home the Pryor Mountain Wild Horse Range. The Beartooth Mountains are the location of Granite Peak, which at 12,807 feet (3,904 m) is the highest point in the state of Montana. The Beartooth Highway, a series of steep zigzags and switchbacks along the Montana–Wyoming border, rises to 10,947 feet. It was called "the most beautiful drive in America" by Charles Kuralt. The Beartooth Mountains are just northeast of Yellowstone National Park. The Crazy Mountains to the west rise to a height of 11,209 feet at Crazy Peak, the tallest peak in the range. Big Snowy Mountains, with peaks of 8,600 feet, are home to Crystal Lake. The Bull Mountains are a low-lying heavily forested range north of Billings Heights. The Absaroka Range stretches about 150 mi (240 km) across the Montana-Wyoming border, and 75 miles at its widest, forming the eastern boundary of Yellowstone National Park. Billings has a hot-summer humid continental climate, closely bordering on semi-arid (Köppen Dfa/BSk), with dry, hot summers, and cold, dry winters. In the summer, the temperature can rise to over 100 °F or 37.8 °C (1 to 3 times per year) while the winter will bring temperatures below 0 °F or −17.8 °C on an average of 17 to 18 nights per year. The snowfall averages 55 inches or 1.40 metres a year, but because of warm chinook winds that pass through the region during the winter, snow does not usually accumulate heavily or remain on the ground for long: the greatest depth has been 33 inches or 0.84 metres on April 5, 1955, after a huge storm which dumped 4.22 inches or 107.2 millimetres of water equivalent precipitation as snow in the previous three days under temperatures averaging 26.7 °F (−2.9 °C). The snowiest year on record was 2014 with 103.5 inches or 2.63 metres, topping the 1996-97 previous record of 98.9 inches or 2.51 metres. The first freeze of the season on average arrives by October 4 and the last is May 7. Spring and autumn in Billings are usually mild, but brief. Winds, while strong at times, are considered light compared with the rest of Montana and the Rocky Mountain Front. Due to its location, Billings is susceptible to severe weather. In most cases, severe storms travel fast at 25 to 30 miles per hour. The first recorded tornado to touch down in Billings was on June 2, 1958. On June 20, 2010, a tornado touched down in the Billings Heights and Downtown sections of the city. The tornado was accompanied by hail up to golf ball size, dangerous cloud-to-ground lightning, and heavy winds. The tornado destroyed a number of businesses and severely damaged the 12,000-seat Rimrock Auto Arena at MetraPark. As of the census of 2010, there were 104,170 people, 43,945 households, and 26,194 families residing in the city. The population density was 2,399.7 inhabitants per square mile (926.5/km2). There were 46,317 housing units at an average density of 1,067.0 per square mile (412.0/km2). The racial makeup of the city was 89.6% White, 0.8% African American, 4.4% Native American, 0.7% Asian, 0.1% Pacific Islander, 1.4% from other races, and 2.9% from two or more races. Hispanic or Latino of any race were 5.2% of the population. There were 43,945 households of which 28.9% had children under the age of 18 living with them, 43.7% were married couples living together, 11.3% had a female householder with no husband present, 4.6% had a male householder with no wife present, and 40.4% were non-families. 32.6% of all households were made up of individuals and 12% had someone living alone who was 65 years of age or older. The average household size was 2.29 and the average family size was 2.90. The median age in the city was 37.5 years. 22.6% of residents were under the age of 18; 9.8% were between the ages of 18 and 24; 26.3% were from 25 to 44; 26.3% were from 45 to 64; and 15% were 65 years of age or older. The gender makeup of the city was 48.3% male and 51.7% female. As of 2000 the median income for a household in the city was $35,147, and the median income for a family was $45,032. Males had a median income of $32,525 versus $21,824 for females. The per capita income for the city was $19,207. About 9.2% of families and 12.0% of the population were below the poverty line, including 16.5% of those under age 18 and 7.0% of those age 65 or over. 29.4% of the population had a bachelor's degree or higher. Billings has many sections that comprise the whole of the city. The sections are often defined by Billings's unique physical characteristics. For example; the Heights are separated from Downtown by a 500-foot (150 m) cliff known as the "Rims." There are currently 11 boroughs called "sections" within the city limits of Billings, Montana. The city's neighborhoods make up the soul of Billings. The south side of Billings is probably the oldest residential area in the city, and it is the city's most culturally diverse neighborhood. South Park is an old growth City park, host to several food fairs and festivals in the summer months. The Bottom Westend Historic District is home to many of Billings first mansions. Midtown, the most densely populated portion of the city is in the midst of gentrification on a level that few, if any, areas in Montana have ever seen. New growth is mainly concentrated on Billings's West End, where Shiloh Crossing is a new commercial development, anchored by Scheels, Montana's largest retail store. Residentially, the West End is characterized by upper income households. Denser, more urban growth is occurring in Josephine Crossing, one of Billings's many new contemporary neighborhoods. Downtown is a blend of small businesses and office space, together with restaurants and a walkable brewery district. The Heights, defined as the area of the city northeast of the Metra, is predominantly residential, and a new school was recently constructed to accommodate growth in the neighborhood. 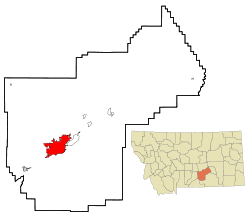 Billings is the principal city of the Billings Metropolitan Statistical Area. The metropolitan area consists of two counties, Yellowstone and Carbon County. The population of the entire metropolitan area was estimated at 165,361 as of the 2013 census estimate. Billings is the county seat of Yellowstone County, the most populous county in Montana. It is also the location of the James F. Battin Federal Courthouse, one of five federal courthouses for the District of Montana. Billings is governed via the mayor council system. There are ten members of the city council who are elected from one of five wards with each ward electing two members. The mayor is elected in a citywide vote. Both the mayor and council members are officially nonpartisan. The current city charter, also called the Billings, Montana City Code (BMCC) was established 1977. The Billings Police Department is the main law enforcement agency in Billings. It is the largest city police force in Montana, with about 136 sworn officers and 80 civilian employees. There are nine police beats. The Billings Fire Department was first founded in 1883 as a volunteer fire company named the Billings Fire Brigade. In 1886, the Yellowstone Hook and Ladder Company was founded; that company was disbanded in 1888 after the mayor criticized the group for how that handled a fire, leaving the town without a fire department for almost six months. The last volunteer fire company, Maverick Hose Company, served as the city's fire department until 1918. The modern fire department has seven stations, employs 114 people, and has been given a class three rating by ISO. The tallest building in Billings and Montana as well as a five state region is the First Interstate Center, which stands at 272 feet (83 m) and 20 floors above ground level. Billings is also home to the tallest load-bearing brick building in the world, the DoubleTree Tower, which stands 256 feet (78 m). With a floor count of 22 floors above ground level the Crowne Plaza is the tallest hotel in the city and state. It was the tallest from 1980 to 1985. 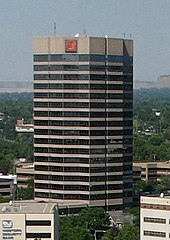 The Wells Fargo Building, formerly the Norwest Bank Building, was the tallest building in Montana from 1977 till 1980. The proposed One Big Sky Center has a height of 324 feet (108 m). It is expected to be completed in 2020. The geographic location of Billings was essential to its economic success. Billings's future as a major trade and distribution center was basically assured from its founding as a railroad hub due to its geographic location. As Billings quickly became the region's economic hub it outgrew the other cities in the region. 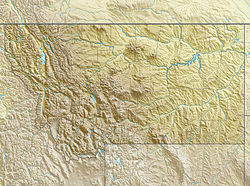 The Billings trade area serves over a half million people. A major trade and distribution center, the city is home to many regional headquarters and corporate headquarters. With Montana having no sales tax, Billings is a retail destination for much of Wyoming, North and South Dakota as well as much of Montana east of the Continental Divide. $1 out of every $7 spent on retail purchases in Montana is being spent in Billings. The percentage of wholesale business transactions done in Billings is even stronger: Billings accounts for more than a quarter of the wholesale business for the entire state (these figures do not include Billings portion of sales for Wyoming and the Dakotas). Billings is an energy center; Billings sits amidst the largest coal reserves in the United States as well as large oil and natural gas fields. In 2009, Fortune Small Business magazine named Billings the best small city in which to start a business. Billings has a diverse economy including a large and rapidly growing medical corridor that includes inpatient and outpatient health care. Billings has a large service sector including retail, hospitality and entertainment. The metro area is also home to 3 oil refineries, a sugar beet refining plant, commercial and residential construction, building materials manufacturing and distribution, professional services, financial services, banking, trucking, higher education (4 campuses, 19 others have a physical presence/classes), auto parts wholesaling and repair services, passenger and cargo air, cattle, media, printing, wheat and barley farming, milk processing, heavy equipment sales and service, business services, consumer services, food distribution, agricultural chemical manufacturing and distribution, energy exploration and production, surface and underground mining, metal fabrication, and many others providing a diverse and robust economy. Corporate headquarters include Stillwater Mining Company, Kampgrounds of America, First Interstate Bank, Computers Unlimited, Tire-Rama, Western Plains Machinery, Tractor & Equipment Co., Optimum, Corporate Air, Employee Benefits Management Services, Edwards Jet Service, Waggoners Trucking, Meadowlark Agency, Ryan Restaurant Corp., CTA Architects & Engineers, JGA Architects, Electrical Consultants Inc. engineering, WorleyParsons Engineering, Energy Labs, and others. The Billings Canal (aka, The Big Ditch), used for irrigation, runs through Billings. 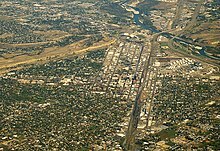 Billings Logan International Airport is close to downtown; it sits on top of the Rims, a 500-foot (150 m) cliff overlooking the downtown core. Scheduled passenger service as well as air cargo flights are operated from this airfield. The Laurel Municipal Airport is a publicly owned public-use airport in Laurel, Montana, which is located eleven miles (18 km) southwest of downtown Billings. The airport has three runways exclusively serving privately operated general aviation aircraft and helicopters. The Billings METropolitan Transit is the public transit system in Billings. MET Transit provides fixed-route and paratransit bus service to the City of Billings. All MET buses are accessible by citizens who use wheelchairs and other mobility devices. They are wheelchair lift-equipped and accessible to all citizens who are unable to use the stairs. MET buses are equipped with bike racks for their bike-riding passengers. There are Westend and Downtown transit centers allowing passengers to connect with all routes. The Billings Bus Terminal is served by Greyhound as well as Jefferson Lines which also provides regional and interstate bus service. Billings has an extensive trail system running throughout the metro area. The rapidly expanding trail system, known as the Heritage trail system, has a large variety of well-maintained trails and pathways. Bicycling magazine ranked Billings among the nation's 50 most bike-friendly communities. In 2012, the Swords Park Trail was named the Montana State Trail of the Year and received an Environmental and Wildlife Compatibility award from the Coalition for Recreational Parks. Interstate 90 runs east–west through the southern portion of Billings, serving as a corridor between Billings Heights, Lockwood, Downtown, South Hills, Westend, Shiloh, and Laurel. East of Downtown, between Billings Heights and Lockwood, Interstate 90 connects with Interstate 94 which serves as an east–west corridor between Shepherd, Huntley, Lockwood, Downtown, South Hills, Westend, Shiloh, and Laurel via its connection with I-90. The 2012 Billings area I-90 corridor planning study recommends many improvements to the corridor from Laurel through Lockwood. Among the improvements recommended are construction of new east and west bound bridges over the Yellowstone River, each bridge having three to four traffic lanes. Also recommended are construction of additional east and west bound traffic lanes from Shiloh to Johnson Lane and reconstruction of many of the bridges, interchanges and on-off ramps along the corridor at a cost of 114 million dollars. The Billings Bypass is a project designed to offer an alternative route into Billings Heights, to create a new and more direct connection between Billings and Lockwood and to connect I-90 with Montana Highway 87 and Old Highway 312. The study portion of the project is nearing its completion. Right of way acquisition should begin in 2013 along with final design followed by construction. Montana Highway 3 is a north–south highway that runs along the edge of the North Rims connecting Downtown and the Westend with the Rehberg Ranch, Indian Cliffs and Billings Heights. U.S. Highway 87 runs through the center of Billings Heights and is known as Main Street within the city limits. This is the busiest section of roadway in the state of Montana. It connects to U.S. Highway 87 East which runs through Lockwood as Old Hardin Road. Until 1979 Amtrak's North Coast Hiawatha stopped at the Billings Depot, serving a Chicago to Seattle route. Before Amtrak, Billings was well-served by Northern Pacific, Great Northern, and Chicago, Burlington, and Quincy railroads with direct routes to Kansas City, Denver, Chicago, Great Falls, and the West Coast. (Billings was the northern and western terminus for the Chicago, Burlington and Quincy Railroad). The city's rapidly growing health care sector in 2012 employed nearly 13,000 people; they earned $641 million in wages, or about 20 percent of all wages in the city. Employment doubled in 25 years and wage rates in constant dollars grew by 162 percent. The city has two Level II trauma hospitals, St. Vincent Healthcare and Billings Clinic. St. Vincent Healthcare was founded in 1898 by the Sisters of Charity of Leavenworth as St. Vincent Hospital. The name was changed to the present name in 2000. The hospital and its 30 clinics currently employ approximately 2,100 people and experience more that 400,000 patient visits per year. St. Vincent Healthcare is run by the Sisters of Charity of Leavenworth Health System, which operates health care facilities in Colorado, Kansas, and Montana. Billings Clinic started in 1911 as the general practice of Dr. Arthur J. Movius. By 1939, three new general practitioners had joined Dr. Movius's practice and the name was changed to The Billings Clinic. Billings Deaconess Hospital (founded in 1907) merged with Billings Clinic in 1990 to form the current hospital. Billings Clinic currently employs around 3,400 people and is one of the largest employers in all of Montana. In July 2012, Billings Clinic received a score of 72/100 for patient safety from Consumer Reports, making it the safest hospital out of the 1,159 hospitals rated. Additionally, in January 2013, Billings Clinic was added to the Mayo Clinic Care Network, only the 12th hospital nationally to be added to the network and the only such health system in Montana. Other medical facilities include the Northern Rockies Radiation Oncology Center, Rimrock Foundation (addiction treatment both inpatient and outpatient), Advanced Care Hospital of Montana (a 40-bed long-term acute-care hospital), South Central Montana Mental Health Center, Billings VA Community-Based Outpatient Clinic, Billings Clinic Research Center (pharmaceutical field trials, osteoporosis are two long-time focuses), Billings MRI, City/County Public Health's Riverstone Health, HealthSouth Surgery Center and Physical Therapy offices, Baxter/Travenol BioLife plasma collection center, and many independent practices. The education needs of the City of Billings are served by five school districts: Billings Public Schools, District 3, Elder Grove School District, Independent School District, and Canyon Creek School District. Billings Public Schools consists of 22 elementary schools, 6 middle schools, and 3 high schools (Senior High, Skyview High, and West High). There are around 15,715 students enrolled and 1,850 people employed full-time by the district. District 3, Independent, and Elder Grove School Districts each contain one elementary school, those being Blue Creek Elementary, Elder Grove Elementary, and Independent Elementary, respectively. Canyon Creek School District operates Canyon Creek School, which serves grades K-8. There are three institutions of higher learning in Billings. Montana State University Billings (MSU Billings) is part of the state university system. Rocky Mountain College and Yellowstone Baptist College are private. Montana State University Billings was founded in 1927 as Eastern Montana Normal College to train teachers. The name was shortened to Eastern Montana College in 1949, and it was given its present name when the Montana State University System reorganized in 1994. The university offers associate/bachelor's/master's degrees and certificates in various fields such as business, education, and medicine. Currently around 5,000 students attend MSU Billings. City College at MSU Billings was established in 1969 as the Billings Vocational-Technical Education Center. Its governance was passed to the Montana University System Board of Regents in 1987, when it became known as the College of Technology. It was officially merged with MSU Billings (then known as Eastern Montana College) in 1994. The name was changed to the present name in 2012. It is known as the "comprehensive two-year college arm" of MSU Billings, and currently offers degrees and programs in a variety of fields including automotive, business, computer technology, and nursing. Through the marriage of three institutions of higher learning Rocky Mountain College is Montana's oldest college. Rocky Mountain College (or RMC) was founded in 1878. The campus that would later become RMC was originally known as the Billings Polytechnic Institute, and in 1947, the BPI joined with the Montana Collegiate Institute in Deer Lodge (Montana's first institution of higher learning) and Intermountain Union College in Helena to form one entity, with students changing the name in 1947 to Rocky Mountain College. During the 2013 fall semester, there were 1,068 students attending Rocky Mountain College. There are currently 50 majors offered in 24 different fields including art, education, music, psychology, and theater. RMC is currently affiliated with the United Church of Christ, the United Methodist Church, and the Presbyterian Church (U.S.A.). Yellowstone Baptist College is a small private Christian college located in western Billings. It offers one degree: Bachelor of Arts in Christian Studies/Leadership. The YBC is affiliated with the Southern Baptist Convention and has close ties with Oklahoma Baptist University in Shawnee, Oklahoma. The YBC also has plans to open up a nondenominational branch called the Yellowstone Bible Institute in early 2013. Billings Artwalk: First Friday of every other month at downtown businesses. With eight microbreweries in the metropolitan area, Billings has more breweries than any community in Montana. The downtown breweries are The Montana Brewing Co, Yellowstone Valley Brewing Co, Thirsty Street Tap Room, Angry Hank's Tap Room, Carters Brewery, and Überbrew. Another nearby brewery, Red Lodge Ales Brewing Co., is located in Red Lodge. Downtown Billings also has a distillery that makes a variety of handcrafted spirits. Trailhead Spirits is located in the former train depot complex. Canyon Creek Brewery opened at the end of 2013 on Billings's west end. Another offering, the Last Chance Pub, opened downtown in 2016. Billings is the largest media market in Montana and Wyoming. Billings is serviced by a variety of print media. Newspaper service includes the Billings Gazette, which is a daily morning broadsheet newspaper printed in Billings, Montana, and owned by Lee Enterprises. It is the largest daily newspaper in Montana, with a Sunday circulation of 52,000 and a weekday circulation of 47,000. The paper publishes in three editions: the state edition, which circulates in most of Eastern Montana and all of South Central Montana; the Wyoming edition, which circulates in Northern Wyoming; and the city edition, which circulates in Yellowstone County. Other publications include other more specialized weekly and monthly publications. Billings also has several community magazines including Magic City Magazine and Yellowstone Valley Woman. The Billings area is served by four major non-news television stations, two major news television stations, one community television station, four PBS channels and several Low-Power Television (LPTV) channels. The Billings area is also served by twenty-two commercial radio stations and Yellowstone Public Radio (NPR). Great American Championship Motorcycle Hill Climb – billed as "The Oldest, Richest and Biggest Motorcycle Hill Climb in the United States"
Rimrock Auto Arena at MetraPark: Originally called the METRA, for "Montana Entertainment Trade and Recreation Arena." It is a 12,000-seat multi-purpose building completed in 1975. In 2007, the naming rights were sold to Billings-based Rimrock Auto Group and the arena now goes by the name Rimrock Auto Arena at MetraPark, it is still owned by the City of Billings and Yellowstone County. It is the largest indoor venue in Montana and is used for concerts, rodeos, ice shows, motor sports events, and more. On June 20, 2010, the building was heavily damaged by the Fathers Day Tornado. According to Metra officials, "the tornado also lifted most of the roof off the arena and collapsed walls." This required extensive repair work and in the process parts of the building were redesigned to improve energy efficiency, parking lot access, acoustics and seating, as well as to add more restrooms and concession areas. On April 10, 2011, the building reopened with an Elton John concert. The Grandstand: a canopied outdoor venue that seats 6,500 for horse racing, rodeos, and other events including outdoor concerts. The Expo Center: a 77,400-square-foot (7,190 m2) multi-purpose arena. The Montana Pavilion: a 28,800-square-foot (2,680 m2) multi-purpose arena. The Alberta Bair Theater is a 1400-seat performing arts venue it is noted for a 20-ton capacity hydraulic lift that raises and lowers the stage apron for performances. It was originally called the Fox Theater, and opened in 1931. It was named in honor of Alberta Bair in 1987 due to her substantial donations that allowed the building to be renovated. She was moved to do so because the land now containing the theater was homesteaded by her father, Charles M. Bair, and she had been born in a nearby house that is still standing, not far from the theater. The Auditorium is a concert venue built in 1950. These days, the Shrine host national shows that might not be able to play Billings if it were not for this smaller cost effective venue. The Shrine seats 2340 for concerts with off street parking for 550 cars. Dehler Park is the new multi-use stadium that replaced Cobb Field and Athletic Park swimming pool in the summer of 2008. Cobb Field was a baseball stadium that was the home of the Billings Mustangs, the Pioneer League Rookie Affiliate of the Cincinnati Reds, since 1948. Cobb Field was named after Bob Cobb, who was responsible for bringing professional baseball with the Mustangs to Billings. Cobb Field also hosted home games for local American Legion baseball teams. In 2006, Billings voters approved $12 million to be spent on constructing a new multi-use sports facility. Cobb Field was demolished in 2007 and construction of Dehler Park began at the end of the 2007 baseball season. The new park debuted on June 29, 2008, when the Billings Scarlets faced the Bozeman Bucks in American Legion regular season play. The new Dehler Park has a crowd capacity of 3,500 to over 6,000. Wendy's Field at Daylis Stadium is a local area stadium used for high school games. It is located adjacent to Billings Senior High. Centennial Ice Arena is home to the Billings Amateur Hockey League, Figure Skating Clubs and Adult Hockey. Babcock Theater is a 750-seat performing arts theater in Billings, Montana. It was built in 1907 and at the time was considered the largest theater between Minneapolis and Seattle. Today, after extensive renovations, it hosts a variety of national acts. The arena is a 4,000-seat venue primarily hosting Yellowjacket sports, local events and occasionally national touring events. This facility contains gyms and racket ball courts as well as an Olympic size pool with bleachers for aquatic events. Fortin Center is a 3,000-seat arena on the campus of Rocky Mountain College it is primarily used for the Rocky Mountain sports events. Ralph McQuarrie, Academy Award winning illustrator for Cocoon, Star Wars Trilogy, Battlestar Galactica and E.T. The USS Billings (LCS-15), a Freedom-class littoral combat ship of the United States Navy, is named after the city of Billings. ^ a b "US Gazetteer files 2010". United States Census Bureau. Archived from the original on January 24, 2012. Retrieved 2012-12-18. ^ a b "American FactFinder". United States Census Bureau. Retrieved December 18, 2012. ^ "ZIP Code Lookup". United States Postal Service. November 10, 2007. Archived from the original on September 3, 2007. Retrieved November 10, 2007. ^ a b "Population Estimates". United States Census Bureau. Retrieved September 29, 2018. ^ a b c d "Best Places to Launch a Small Business 2009 – Billings, MT – FORTUNE Small Business". CNN. Retrieved August 7, 2012. ^ a b c Big Sky Economic Development. "Big Sky Economic Development". Bigskyeda-edc.org. Retrieved August 7, 2012. ^ "Lockwood CDP QuickFacts from the US Census Bureau". Quickfacts.census.gov. Archived from the original on June 16, 2012. Retrieved August 7, 2012. ^ Lutey, Tom (December 19, 2010). "Billings economy not an illusion". Missoulian.com. Retrieved August 7, 2012. ^ a b "Eastern part of state faring better economically". BillingsGazette.com. December 26, 2010. Retrieved August 7, 2012. ^ a b "Bakken: The Biggest Oil Discovery in U.S. History". Marketwire.com. April 15, 2008. Retrieved August 7, 2012. ^ a b "Bakken: The Biggest Oil Discovery in U.S. History | wallstreet:online". Wallstreet-online.de. April 15, 2008. Retrieved August 7, 2012. ^ "A piece of the oil action". BillingsGazette.com. March 6, 2011. Retrieved August 7, 2012. ^ "Experts say Billings will benefit from energy boom". BillingsGazette.com. March 4, 2011. Retrieved August 7, 2012. ^ "N. Dakota Bakken Oil Deposit Would Free USA of Foreign Oil Dependence – 2012 Pole Shift Witness". 2012poleshift.wetpaint.com. Retrieved August 7, 2012. ^ "The Shores of an Ancient Sea" (PDF). Montana Department of Transportation. Retrieved March 27, 2013. ^ "Pictograph Cave State Park". Montana Fish, Wildlife, and Parks. Retrieved February 26, 2013. ^ "Pictograph Cave". National Park Service. Archived from the original on September 5, 2012. Retrieved 26 February 2013. ^ Meriwether Lewis and William Clark. "The Journals of Lewis and Clark, 1804-1806". Project Gutenburg. Retrieved February 26, 2013. ^ "Pompeys Pillar National Monument". Bureau of Land Management. Archived from the original on March 16, 2013. Retrieved February 26, 2013. ^ a b c d e "Historic Downtown Billings – Historical Overview". Yhpb.org. Archived from the original on March 16, 2012. Retrieved August 7, 2012. ^ "Yellowstone County Towns, Train Stations & Post Offices". rootsweb. Retrieved March 27, 2013. ^ Carkeek Cheney, Roberta (1983). Names on the Face of Montana. Missoula, Montana: Mountain Press Publishing Company. p. 5. ISBN 0-87842-150-5. ^ "Montana Place Names Companion". Montana Historical Society. Retrieved July 25, 2017. ^ "Billings: History". Advameg, Inc. Retrieved March 27, 2013. ^ "John Liver Eating Johnston". Johnlivereatingjohnston.com. July 5, 2009. Retrieved August 7, 2012. ^ "Taylor". Billings.k12.mt.us. Retrieved August 7, 2012. ^ Skyscraper Source Media Inc. "First Interstate Center". Retrieved August 1, 2012. 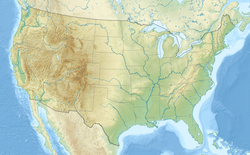 ^ Thirteenth Census of the United States, 1910: Population by Counties and ... – United States. Bureau of the Census. Google Books. May 17, 2012. Retrieved August 7, 2012. ^ "Population of Billings, Montana". Billings /: population.us. Retrieved March 11, 2019. ^ "Crowne Plaza, Billings, U.S.A". Billings /: Emporis.com. Retrieved August 7, 2012. ^ "Buildings of Billings". Emporis.com. Retrieved August 7, 2012. ^ "First Interstate Center, Billings, U.S.A". Billings /: Emporis.com. Retrieved August 7, 2012. ^ "Mount St. Helens – From the 1980 Eruption to 2000, Fact Sheet 036-00". pubs.usgs.gov. Archived from the original on May 12, 2013. Retrieved August 7, 2012. ^ "Yellowstone's Year Of Fire-1988". Yellowstone-bearman.com. August 20, 1988. Retrieved August 7, 2012. ^ "Preserve America Community". Preserveamerica.gov. March 13, 2009. Retrieved August 7, 2012. ^ "Transtech Center". Transtech Center. Retrieved August 7, 2012. ^ "Shiloh Road open end to end". BillingsGazette.com. November 13, 2010. Retrieved August 7, 2012. ^ "Kohl's Department Stores: Store Locator". Kohlscorporation.com. Retrieved August 7, 2012. ^ "Cabela's Billings, MT Store". Cabelas.com. Retrieved August 7, 2012. ^ a b "Magazine names Billings best small city for launching business". BillingsGazette.com. October 13, 2009. Retrieved August 7, 2012. ^ "One Big Sky Center". www.onebigskycenter.com. Retrieved April 13, 2018. ^ "Hiking & Backpacking". 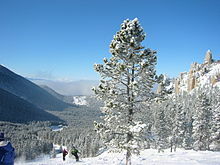 BighornMountains.Com. Retrieved August 7, 2012. ^ "The Pryor Mountains". The Pryors Coalition. Retrieved August 7, 2012. ^ Robbins, Jim. "U.S. Budget Cuts Imperil Remote Town's Lifeline". The New York Times. Retrieved August 17, 2012. ^ "Crazy Mountains". Peakbagger.com. November 1, 2004. Retrieved August 7, 2012. ^ "Crystal Lake in the Big Snowy Mountains". Montanahikes.com. Retrieved August 7, 2012. ^ "The Absaroka Mountain Range". greater-yellowstone.com. Retrieved May 11, 2016. ^ Peel, M. C., Finlayson, B. L., and McMahon, T. A.: Updated world map of the Köppen-Geiger climate classification, Hydrol. Earth Syst. Sci., 11, 1633–1644, 2007. ^ a b "Climatography of the United States No. 20: BILLINGS INTL AP, MT 1971–2000" (PDF). National Oceanic and Atmospheric Administration. Retrieved September 25, 2010. ^ "Climatography of the United States No. 20: BILLINGS WATER PLANT, MT 1971–2000" (PDF). National Oceanic and Atmospheric Administration. Retrieved September 25, 2010. ^ a b c "NOWData - NOAA Online Weather Data". National Oceanic and Atmospheric Administration. Retrieved February 19, 2015. ^ Matt Brown, Associated Press Writers (June 20, 2010). "UPDATED: Tornado heavily damages MetraPark, Billings stores". Mtstandard.com. Retrieved August 7, 2012. ^ "MT Billings Logan INTL AP". National Oceanic and Atmospheric Administration. Retrieved February 19, 2015. ^ "WMO climate normals for Billings/Logan Int'L ARPT, MT 1961−1990". National Oceanic and Atmospheric Administration. Retrieved February 19, 2015. ^ "MT Billings WTP". National Oceanic and Atmospheric Administration. Retrieved February 19, 2015. ^ "Population and Housing Unit Estimates". Retrieved September 29, 2018. ^ United States Census Bureau. "Census of Population and Housing". Archived from the original on May 12, 2015. Retrieved May 31, 2014. ^ The Office of Management and Budget. "Update of Statistical Area Definitions and Guidance on Their Uses" (PDF). p. 26. Archived from the original (PDF) on March 16, 2012. Retrieved August 16, 2012. ^ United States Census Bureau. "Annual Estimates of the Population of Metropolitan and Micropolitan Statistical Areas: April 1, 2010 to July 1, 2013". Archived from the original on June 27, 2014. Retrieved May 31, 2014. ^ "City Council Members". The City of Billings, Montana. Retrieved September 12, 2010. ^ "About Yellowstone County, Montana". Yellowstone County, Montana. Retrieved February 28, 2013. ^ "Courthouse Locations". U. S. District Court of Montana. Archived from the original on February 28, 2013. Retrieved February 28, 2013. ^ "History of the Billings Fire Department". City of Billings. Retrieved February 24, 2013. ^ "Taking Off". City of Billings. Retrieved February 24, 2013. ^ "The Modern Era". City of Billings. Retrieved February 24, 2013. ^ "First Interstate Center | Buildings". Billings /: Emporis. Retrieved August 7, 2012. ^ "Wells Fargo Plaza". Emporis GmbH. Retrieved March 27, 2013. ^ Lutey, Tom (December 18, 2011). "Billings ahead of almost everywhere: Agriculture, retail, energy, health care driving economy". Missoulian.com. Retrieved August 7, 2012. 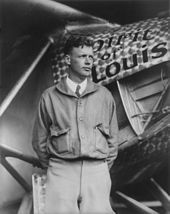 ^ "Laurel Municipal Airport". Google. January 1, 1970. Retrieved August 7, 2012. ^ "City of Billings, MT – MET Transit". Ci.billings.mt.us. June 8, 2012. Retrieved August 7, 2012. ^ "Home". Greyhound.com. Retrieved August 7, 2012. ^ "Billings Parks & Rec – Trails". Prpl.info. Archived from the original on July 4, 2012. Retrieved August 7, 2012. ^ "Bicycling's Top 50 | Bicycling Magazine". Bicycling.com. Archived from the original on March 18, 2015. Retrieved August 7, 2012. ^ "Swords Park gets state, national honors". BillingsGazette.com. June 10, 2012. Retrieved August 7, 2012. ^ DOWL HKM. "Billings Area I-90 Corridor Planning Study". City of Billings. Retrieved March 27, 2013. ^ "Project Description". Billings Bypass EIS. Archived from the original on January 16, 2014. Retrieved March 27, 2013. ^ Billings, Mt (January 1, 1970). "billings montana". Google. Retrieved August 7, 2012. ^ "Verified Trauma Centers". American College of Surgeons. Retrieved February 1, 2013. ^ "History". St. Vincent Healthcare. Archived from the original on March 21, 2013. Retrieved February 1, 2013. ^ "2011 Facts". St. Vincent Healthcare. Retrieved February 1, 2013. ^ "Where We Serve". SCL Health. Retrieved April 21, 2017. ^ "History of Billings Clinic". Billings Clinic. Archived from the original on July 12, 2014. Retrieved February 1, 2013. ^ "About Billings Clinic". Billings Clinic. Retrieved February 1, 2013. ^ Uken, Cindy (July 5, 2012). "Billings Clinic tops Consumer Reports list for hospital safety". Billings Gazette. Retrieved August 7, 2012. ^ Uken, Cindy (January 9, 2013). "Billings Clinic forms formal relationship with Mayo Clinic". Billings Gazette. Retrieved February 1, 2013. ^ "About Billings Public Schools". Billings Public Schools. Archived from the original on March 21, 2013. Retrieved February 28, 2013. ^ "About Us". Blue Creek School. Archived from the original on June 24, 2012. Retrieved February 28, 2013. ^ "District Information". Elder Grove School. Archived from the original on May 27, 2014. Retrieved February 28, 2013. ^ h "Grace Montessori Academy, a Billings Christian Montessori School". ^ Montana State University Billings. "History & Overview of MSU Billings". Retrieved August 8, 2012. ^ Montana State University Billings. "Degrees, Programs, & Minors". Archived from the original on August 29, 2012. Retrieved August 9, 2012. ^ Montana State University Billings. "Full and Part Time Enrollment". Institutional Research. Archived from the original on January 17, 2013. Retrieved August 8, 2012. ^ "About the College". Montana State University Billings. Retrieved September 19, 2012. ^ Pickett, Mary. "Regents approve new COT names". The Billings Gazette. Retrieved September 19, 2012. ^ "City College Home". Montana State University Billings. Retrieved September 19, 2012. ^ "Degrees and Programs". Montana State University Billings. Retrieved September 19, 2012. ^ "About RMC". Rocky Mountain College. Retrieved January 31, 2013. ^ "History of RMC". Rocky Mountain College. Retrieved January 31, 2013. ^ "Fall 2013 Student Body Profile" (PDF). Rocky Mountain College. Retrieved March 27, 2014. ^ "RMC - Majors". Rocky Mountain College. Retrieved January 31, 2013. ^ "General Information". Rocky Mountain College. Retrieved January 31, 2013. ^ "Degree Offerings". Yellowstone Baptist College. Archived from the original on February 15, 2013. Retrieved January 31, 2013. ^ a b Olp, Susan (December 15, 2012). "Yellowstone Bible Institute to open its doors in January". Billings Gazette. Retrieved January 31, 2013. ^ Staff (April 28, 2007). "Gay Pride festival takes shap". Billings Gazette. Retrieved November 11, 2014. ^ "MontanaFair in Billings". Retrieved September 13, 2010. ^ Jan Falstad (April 29, 2012). "Thirst for craft beers prompts a boom in Billings brew pubs : Business". BillingsGazette.com. Retrieved August 7, 2012. ^ Howard, Tom (February 1, 2013). "Trailhead Spirits: Distilling Montana's essence into memorable beverages". Billings Gazette. ^ Brenda Maas (November 1, 2013). "Construction Zone: Canyon Creek Brewery adds variety to West End". ^ Lee DMS Group (April 24, 2009). "Magic – Billings' City Magazine Since 2003". Magiccitymagazine.com. Retrieved August 7, 2012. ^ "Yellowstone Valley Woman". Yellowstone Valley Woman. Retrieved August 7, 2012. ^ "Billings Television Broadcasting Companies & Stations in Billings MT Yellow Pages by SuperPages". Superpages.com. Retrieved August 7, 2012. ^ "Radio Stations in Billings MT". Retrieved August 7, 2012. ^ "MetraPark Arena naming rights sold". BillingsGazette.com. February 12, 2007. Retrieved August 7, 2012. ^ Facilities. "MetraPark Facilities | Arena, Expo Center, Montana Pavilion, The Grandstands". Metrapark.com. Archived from the original on June 8, 2011. Retrieved August 7, 2012. ^ "Montana Tornado Rips Roof off Sports Arena". Cbsnews.com. Retrieved August 7, 2012. ^ "MetraPark construction still aims for April finish". BillingsGazette.com. December 1, 2010. Retrieved August 7, 2012. ^ "Architects update proposal for arena". BillingsGazette.com. September 30, 2010. Retrieved August 7, 2012. ^ MetraPark. "The Expo Center". Archived from the original on June 21, 2011. Retrieved August 1, 2012. ^ MetraPark. "The Montana Pavilion". Archived from the original on June 21, 2011. Retrieved August 1, 2012. Wikimedia Commons has media related to Billings, Montana.